John earned a Bachelor of Science degree at Loras College in Dubuque, Iowa. In 1975, he received his masters of science in Zoology from the University of Nebraska at Lincoln. That same year, John and his family moved to Norfolk, Nebraska to farm the family farm. In 1994, he earned a degree in Mortuary Science from Kansas City Community College in Kansas City, Kansas. He returned to Norfolk where he was employed by Home for Funerals and became the owner in 2001. John is a member of Sacred Heart - Saint Mary's Catholic Church in Norfolk. He is an active member in the Norfolk Morning Kiwanis and the Knights of Columbus. He is married to Sue and has 2 daughters and 4 grandchildren. He enjoys his family, traveling and outdoor activities. John is a compassionate and kind hearted funeral director who is devoted to caring for those in need. Eric was born and raised in Norfolk, Nebraska. He is a graduate of Norfolk Catholic High School. Afterwards, he attended Northeast Community College and the University of Nebraska at Lincoln. During his 20 years in the insurance industry, he began raising his family in Norfolk. In 2004, Eric received his degree in Mortuary Science from the Arapahoe Community College in Denver, Colorado. He became an employee of Home for Funerals in 2011. Eric is a member of Sacred Heart - Saint Mary's Catholic Church in Norfolk. He is an active member in the Norfolk Catholic Booster Club and the Knights of Columbus. Eric is the current president in of the Norfolk Catholic Academic Excellence. He has been the past president of Norfolk Catholic Athletic Boosters and Norfolk Catholic School Board. Eric is married to Deb and has 2 children. He enjoys hunting, fishing and is an amazing cook. Eric's knowledge of and longtime involvement in the community gives him a personal connection serving families. Erik was born and raised in Bellevue, Nebraska. He is a graduate of Bellevue East High School. Afterwards, he attended Iowa State University, the University of Nebraska - Omaha where he obtained a Bachelor's Degree in Biology, and the University of Nebraska - Lincoln where he obtained a Master's Degree in Biology. In 2002, Erik received his degree in Mortuary Science from Kansas City Community College in Kansas City, Kansas. He completed his apprenticeship at Home for Funerals. 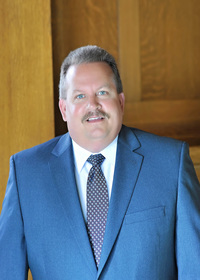 In 2004, Erik began work as a funeral director at Bethany Funeral Home in La Vista, Nebraska. He returned as an employee of Home for Funerals in 2015. Erik and his family are members of the First Congregational United Church of Christ Church in Norfolk. Also, he is a member of the Norfolk Lions Club. Erik is married to Katie and has 2 sons. He enjoys spending time with his family and playing tennis. Erik is a hard working and compassionate funeral director who does his utmost to serve families.